I, your faithful reviewer, promising to be sound in mind and body, reasonably sober etc etc blah blah, do hereby declare that man this is good! The booklet notes for this release conclude “No, we are never finished with Beethoven!”, and this recording proves the point in many ways. Beethoven’s Symphony No. 9 is both enigmatic and transparent. We’re always told it is a flawed masterpiece, but perhaps never really stopped to wonder how or why. In any case, we love it despite, perhaps even because of its hairy warts. Love or hate Jan Willem de Vriend’s performance, one of the things he is not afraid of doing is revealing every moment of this piece with sharp and spot-lit scrutiny. This is a long way from the opulent and shimmering aura created around the work by conductors like Herbert von Karajan. It is by no means a ‘chamber’ reading, but De Vriend handles The Netherlands Symphony Orchestra like a string quartet, and the resulting power is up close and personal: he holds up each moment like the yet beating heart of an Aztec sacrificial victim, and the result is that we can gain even more new insights into this remarkable creation. It has no doubt been pointed out before, but this performance lays it out more barely than most, that Beethoven’s Symphony No. 9 is an alchemic artistic wonder, somehow created from a long string of musical banalities. This is part of the way Beethoven works in most of his symphonies of course, developing themes made up from minimal resources, and then building them into collectively monumental shapes which follow pretty much all of Henry Moore’s early rules for sculpture: truth to your materials, avoidance of slavish reproduction or search for the merely beautiful, achievement of powerful expression through the contrasts of surging tension, texture, rhythm and spatial sense: all of that stuff from which we can learn to apply in every form of art. The booklet notes include the results of discussions with Jan Willem de Vriend, in which we are reminded that a Welsh steam engine came to use in Vienna at the same time as the first sketches for the ninth were being made. You can certainly hear the motoric energy and sense of precipitate speed in the second movement’s Molto vivace, though I first heard it as more of a kind of operatic scene out of which it was as likely for a vocal soloist to emerge as in the finale, this time with myriad members of the choir milling around behind with purposeful intent. By no means inflexibly machine-like, this Beethoven certainly does have the surging drive of never-before seen objects of infernal modern design and untold effects on the human soul. Compared with John Eliot Gardiner’s recording with the Orchestre Revolutionnaire et Romantique on the Archiv label, De Vriend is less keen on allowing the music its moments to breath, favouring unstoppable onward impetus and maintaining a tensile line of force even where the dynamic falls and holes appear in the music like an Emmentaler cheese. I prefer the Dutch drums as well, which have a more usefully dark and less upper-harmonic rich tone to Gardiner’s French revolutionary. Excellent though this pungent period-instrument performance is I think this NSO version is even more inspiring. When was the last time you saw a classical music release advertised on the side of a bus? 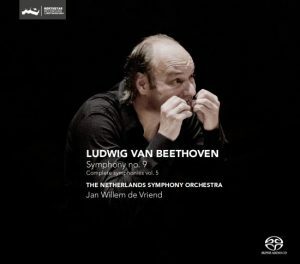 I enjoyed the 7th and 8th symphonies in this complete cycle (see review), and this fifth volume is a fitting crown to a remarkable cycle, now available as an attractive box set which I’ve seen more than once promoted on the side of Dutch trams. Boisterous and energetic it may be, with more rhythmic punch than a Power Ranger, but the most tender moments are truly gorgeous, with the poetry of the Adagio molto e cantabile expressed unsentimentally but with a proportionate relationship to the whole - a subsumed sense of eruption rather than of flaccid repose, but performed with grace and lyrical sensitivity. There is that question of vibrato in the strings, and if you are looking for Berlin Philharmonic warmth then this is one place you won’t find it. I don’t find this in the least disturbing, but tastes differ. So, we’re back to going along at fever pitch in the Finale and it’s wow wow whoop all the way. The only hurdle to be crossed is where the singing starts, and here is the only point at which I have to start throwing mild critical barbs. Baritone Geert Smits, instead of entering into the swift and high-octane spirit of the whole thing, takes the opening ‘O Freunde…’ as a Big Solo, ascending a throne as a veritable king, rather than rising from amongst the orchestral colleagues as one of the ‘Freunde’. This rather over-fed recitative continues to sap the energy and drag in tempo as the Allegro assai takes flight, and one has the feeling that the onward momentum suffers throughout this whole section. The parps of the contrabassoon are superb in the Alla Marcia though, and tenor Marcel Reijans restores a feeling of collective heroism in the “Froh, froh...” solo, ably supported by the men of the chorus. 12:35 in and that famous full choral tune enters with superb drive and energy, cruising triumphantly over the deliberately sought out syncopations in the drum. Listen too for the way De Vriend brings out the orchestra in the gaps between the singing - just one of numerous little tricks which keep everything dynamic and deliciously direct and down to earth. The choir is perhaps not quite as strong as the orchestra it has to be said, with one or two ‘flat’ moments such as the Andante maestoso at 13:25, where the unison men could have sounded a bit more involved. They are also less at home in the highest notes, but this is pretty extreme choral writing after all. On the whole things are very good however, and there are no real ‘if only’ places which will return to haunt you on repeated listening. I’ve deliberately avoided going through the whole thing with the score and a fine toothcomb - we’d be here all week: the overall effect is the most important thing, not pointing out little details which you probably wouldn’t notice if they weren’t picked out and shoved under your nose. This is a tremendous and remarkably revealing performance of Beethoven’s Symphony No. 9, and with the added bonus of SACD surround sound it is also a genuinely spectacular sonic experience. With all the benefits and strengths of modern instrument sonority allied with period brass and historical interpretative learning this is pretty much the state of the art when it comes to this work, and if you thought you knew it well through the sheen of your 1970s and 1980s favourites then this is a very good place to allow yourself to be given a healthy kick into some new thinking.